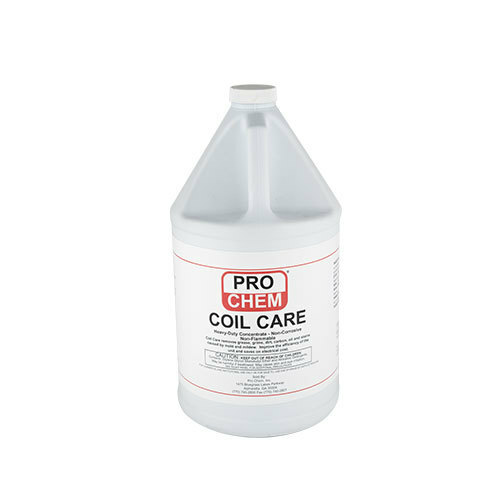 Coil Care | Pro Chem, Inc. COIL CARE is a concentrated, water-based, butyl, heavy-duty cleaner/degreaser. It has the ability to penetrate, emulsify and lift away most soils found on air conditioning coils, fins and filters. 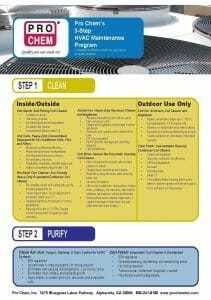 Regular use of this producxt boosts air conditioning systems efficiency and also helps cut electrical costs. It will not induce corrosion of ferrous materials. This product is environmentally safe. It contains no highly toxic solvents and the surfactants contained are considered 95% biodegradable. As a cleaner, it removes soils such as grease, ink, oil, dirt, wax and carbon. Removes stains associated with mold and mildew. Coil Care is intended for use as a compound for treating boilers, steam lines, and/or cooling systems where neither the treated water nor the steam produced may contact edible products in areas of official establishments operating under the Federal meat, poultry, shell egg grading and egg products inspection programs where there is no possibility of food contact in food processing and food handling establishments. Dilute one part concentrate with 10 parts water and spray directly onto fins and coils using a pump sprayer. After 3 to 5 minutes, rinse with water. Do not use undiluted near glass, water-based painted surfaces, copper, or aluminum.